Have you heard? StockCar Racing Experience (SRE) has a few new toys in the garage. They’re called Polaris Slingshots and they just may be the next big thing in motorsports. Featuring three wheels, two seats and a sleek, sporty design, Polaris Slingshots hit the market last year. StockCar Racing Experience acquired a pair this July, and in early September launched Pocono Slingshot Rentals—the newest way to tour the Pocono Mountains. We hit the road with SRE&apos;s Ian Roverana to experience the thrill of a self-guided tour. 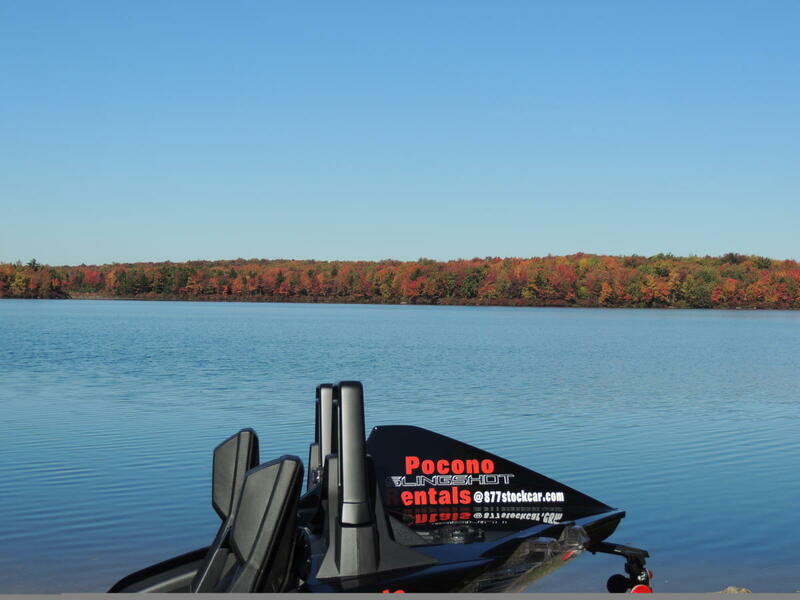 Read on for details on our experience and how you can tour the Pocono Mountains with Pocono Slingshot Rentals. With engines rumbling, we rolled out of the parking lot and up Route 115 toward the Raceway. From there, we slipped onto Stoney Hollow Road and were met with some stunning fall foliage. 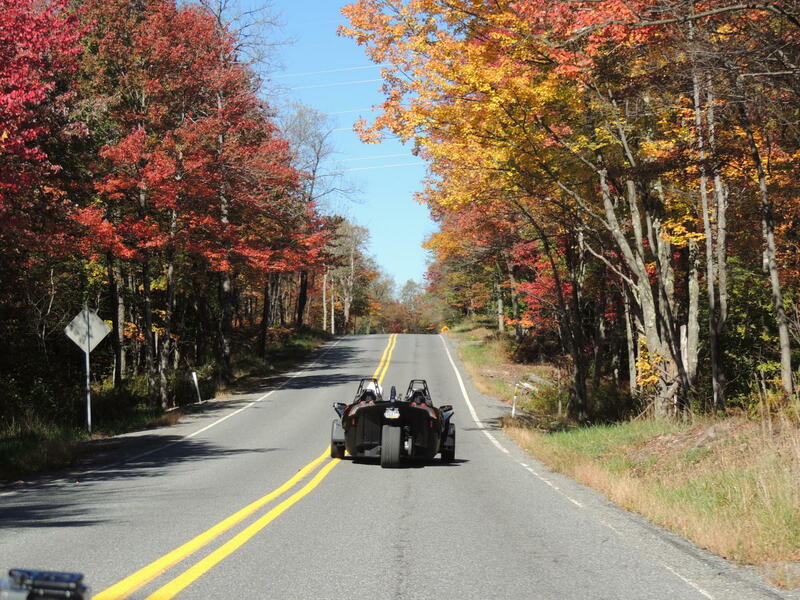 The three-wheeled Slingshots handled back-road curves with ease, and we were able to snap clear photos of the autumn colors. Stoney Hollow took us to Route 940, where we caught Route 423 toward Tobyhanna State Park. Fall colors were popping around Tobyhanna Lake, and we couldn&apos;t resist stopping to take in the scene. We parked the Slingshots on the shore and set out to snap a few photos. Locking compartments behind the seats make it easy to secure personal items in the Slingshots. We stowed helmets and camera bags with space to spare. Once thoroughly warmed by the autumn sun (be sure to dress as if you’re riding a motorcycle! ), we climbed back into the Slingshots and headed for the highway. Three-point seat belts kept us safe and secure, and the shields on our helmets blocked out the wind. With these safety measures in place, we were able to relax and enjoy our high-speed ride. Helmets are required for Slingshot drivers and passengers who don’t have a motorcycle license. You can learn more about this and other precautions on the Pocono Slingshot Rentals website. After our brief highway ride, we took Sullivan Trail to Big Pocono State Park. This is a spectacular place to test the Slingshot’s 360-degree views. You can see three states from the summit! We fielded a few questions here (be prepared for attention—these things turn heads!) and took the opportunity to break for lunch. A quick trip down Camelback Mountain brought us to Barley Creek, where we parked in standard spots and secured our valuables in the locking compartments. After lunch, we took Interstate 80 back to the StockCar Racing Experience and wrapped up a great ride. Our route covered hills and highways, straightaways and winding roads, and the Slingshots exceeded expectations in all areas. The trikes run smooth and steady, but with all the fun of a motorcycle ride. Polaris Slingshots make it possible to get that open-air, wind-in-your hair experience without a bike or special license. And starting at just $199, a trip through Pocono Slingshot Rentals won&apos;t bust your budget. The tours are great for dates, bachelor parties, girls/guys&apos; weekends and sightseeing adventures. Multiple units are available, but they’re bound to book up as word gets around. 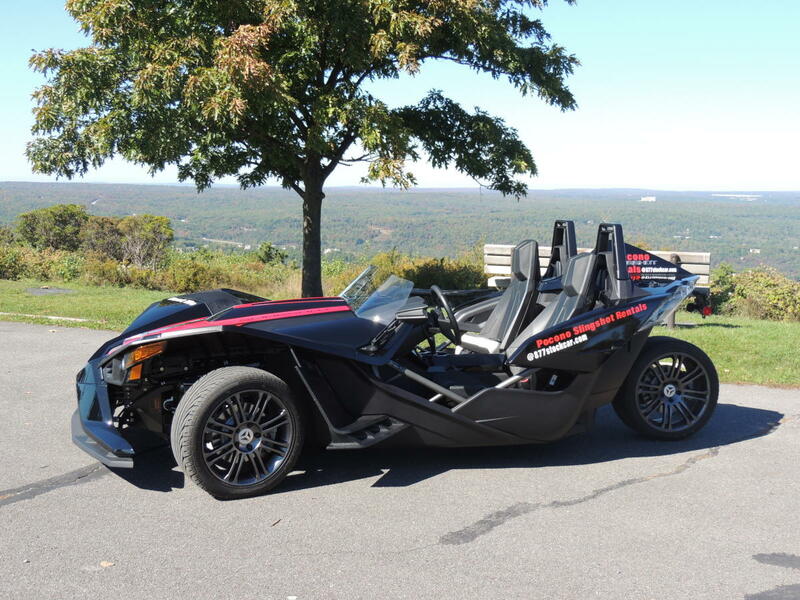 Plan your Pocono Slingshot tour today! Pocono Slingshot Rentals permits travel anywhere in the state. 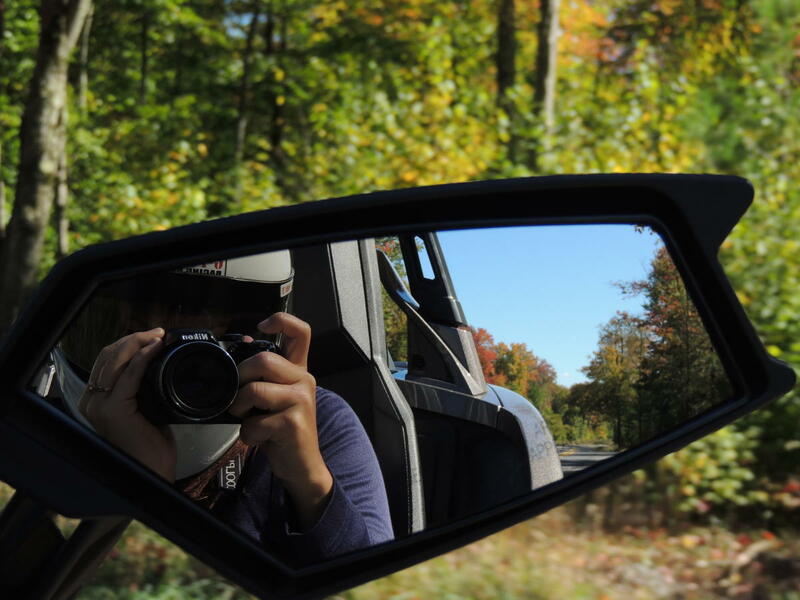 You can choose a suggested route through the Pocono Mountains or plan your own path on the open road. Pocono Slingshot Rentals is now accepting reservations for the 2017 season. You can purchase a gift voucher for the holidays or enter to win one on our Facebook page. We’ll be giving away a half-day package in early December. The Polaris Slingshot is a reverse trike—a motorcycle with two wheels up front and one in the back. The two-seat roadster permits 360-degree views from an open-air cockpit. Each vehicle comes standard with five-speed manual transmission and gets about 30 miles per gallon of gas. 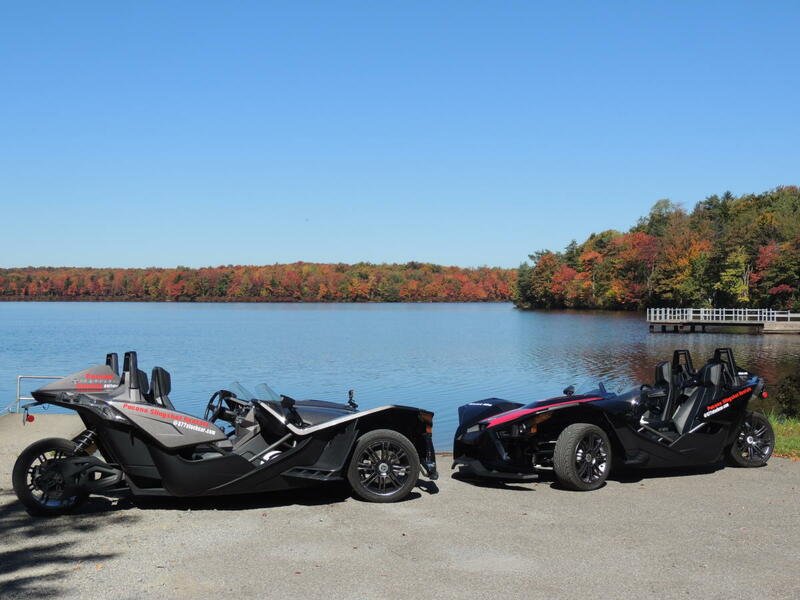 At Pocono Slingshot Rentals, licensed drivers 25 and older can rent a Polaris Slingshot for a four-hour half or eight-hour full day experience. Motorcycle licenses are not required. Drivers must be able to operate a five-speed manual transmission vehicle. Passengers must be 18 or older. Contact Pocono Slingshot Rentals for full information. Pocono Slingshot Rentals is a division of the StockCar Racing Experience. For more information, visit 877stockcar.com/pocono-slingshot-rentals/. For other ways to explore the Pocono Mountains, check out our Tours and Sightseeing and Suggested Itineraries pages. Want more Polaris Slingshot action? Watch this timelapse from our trip!